As a companion to my article on Caliber and Terminal Ballistics, I'd like to present a brief overview of common handgun calibers. 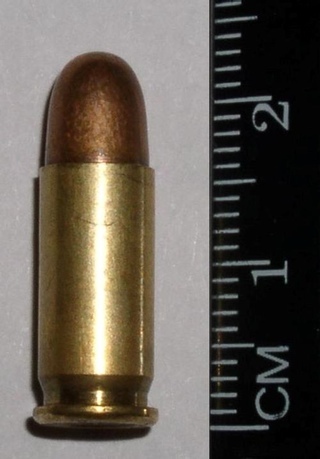 The 9mm Luger (also known as the 9mm Parabellum or 9x19mm) is one of the world’s most widely used handgun cartridges. It is the standard handgun round for all NATO nation’s military forces. More than 60% of U.S. police firearms are 9mm. I won’t beat around the bush here, I recommend the 9mm. It is sufficiently powerful to reach the vitals reliably, but not so powerful that it suffers from excessive recoil. The caliber is small enough that a compact or full size pistol can hold 15-17 rounds. The .40 Smith & Wesson is a popular round with many police agencies. It is often seen as a compromise between the 9mm and the .45. Guns chambered in .40 don’t give up much in terms of capacity (double stack magazines usually hold 2 fewer rounds than 9mm). However, the recoil of the .40 S&W is quite snappy, slowing follow up shots and making one-handed shooting more difficult. The .45 ACP is the classic American handgun caliber. Despite being larger than the .40 S&W, the .45 actually has a milder recoil (often describe as more of a push in contrast to the snappy .40). Where the .45 really suffers is the size of the round. 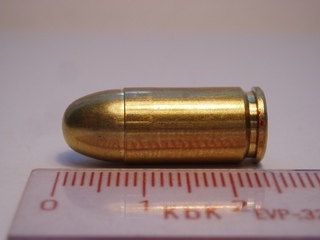 Not only is it bigger in diameter, it is also substantially longer than a 9mm or .40. This means a larger magazine and a larger grip. Most people with average size or smaller hands are going to have a difficult time gripping a double stack .45. These pistols are often described as having a grip like a 2x4. This leads many people attached to the .45 to use to a single stack pistol, severely limiting capacity. While the 9mm, .40, and .45 make up the vast majority of service caliber pistols in the U.S., there are several less common alternatives. In addition to their individual quirks all of these calibers suffer from some disadvantages associated with their relative rarity. Practice ammo in these calibers will be more expensive and is usually less likely to be in stock at your local gun shop or big box store. Self-defense ammo probably won’t be more expensive than the more common calibers, but it will be harder to find. That said, during the recent ammo shortage, it was sometimes easier to find ammo in these calibers. While there was less of this ammo out in the marketplace, demand for these niche calibers was also a lot less. The .357 SIG is based on the .40 S&W case necked down to accept the smaller .357 caliber bullet. With the larger powder charge of the .40 driving a 9mm bullet it can produce some very impressive velocities (though keep in mind that higher velocities don’t necessarily improve terminal performance in a human target). The .357 SIG was intended to duplicate the performance of the .357 Magnum revolver round. It doesn't quite achieve this level of performance, but it’s still quite impressive for a pistol round. Being a derivative of the .40 S&W, it suffers from the same disadvantages: a slightly smaller capacity and quite snappy recoil. It is also noted for being one of the loudest pistol rounds on the market. While the extra velocity of the .357 SIG is not necessarily all that useful from a terminal performance standpoint, it does have some benefits against certain intermediate barriers, such as auto bodies. This is more of a benefit in police use and several law enforcement agencies have adopted the .357 SIG for this reason. 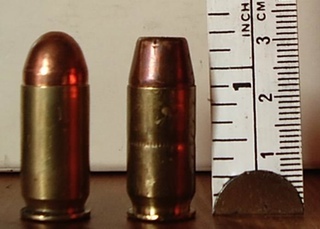 The 10mm Auto suffers from many of the same size issues as the .45 ACP. Indeed, most 10mm pistols are built on the same frames as their manufacturer’s .45s. The recoil of full power 10mm loads is quite substantial, even more so than the .40 S&W. Many ammo manufacturers download their 10mm ammunition to more modest velocities, roughly equal to the .40 S&W, in which case you might as well be carrying a .40 (indeed, this is exactly why the .40 was developed, to duplicate the light 10mm loads in a smaller package). With full power loads, the 10mm is a good choice for defense against dangerous animals, but against human predators the extra size and recoil is unnecessary. The .45 GAP (Glock Automatic Pistol) is an attempt to attain the performance of the .45 ACP in shorter round (the same length as the 9mm and .40). This allows a .45 caliber round to fit in a more manageable handgun. While the .45 GAP is shorter in length than the .45 ACP, it is still .45 inches in diameter, which limits the number of rounds in the magazine quite significantly. The .380 ACP is basically a shorter, less powerful version of the 9mm. Indeed, in Europe it is known as the 9mm Kurz or 9mm Short. In the past the .380 has received much criticism for it’s lack of power. While I’ve repeatedly warned against excessive power in a handgun round, the .380 is definitely pushing the lower bounds of what will be effective on a human target. However, newer ammunition has remedied these shortcomings somewhat. The bigger issue with the .380 is not the round itself, but the small keychain guns that it tends to be chambered in. Any lack of power in the round is irrelevant if a gun is so small it is difficult to shoot effectively. One other issue anyone contemplating a .380 should be aware of is availability. .380 ammunition was difficult to find even before the recent ammunition shortage, largely because the popularity of small .380 handguns outpaced production of ammunition for them. The .32 ACP or 7.65x17mm Browning was a popular cartridge earlier in the century, though it has largely fallen out of favor. The .32 ACP is definitely below what I would consider an acceptably powerful cartridge for self defense. Even more than the .380 it suffers from being chambered only in the smallest and most difficult to shoot pistols. 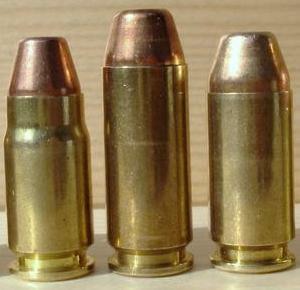 The little brother of the .32 ACP, the .25 ACP is among the least powerful cartridges out there. It is even less powerful than the .22LR. Compared to the .22 it does have the advantage of more reliable feeding in a semi-auto. Not only is the .25 ACP less powerful than any of the alternatives, its smaller size doesn’t even really provide any advantages in terms of the size of the pistol. At this point the size of the gun is limited by the size of the human hand, not the the cartridge. 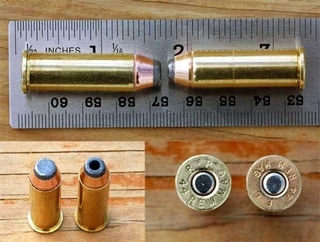 The .22 Long Rifle differs from the other cartridges mentioned here in that it is a rimfire cartridge. Rather than having a primer embedded in the center of the cartridge the priming compound is embedded in the thin rim of the case and ignited by being crushed between the firing pin and the chamber. The .22LR has killed a lot of people over the years. Despite this it is not a very good self defense caliber because it seldom kills quickly. It lacks sufficient penetration to reach vital organs and is easily deflected by bone. This ease of deflection can actually enhance lethality as the bullet tumbles through the body. However, it detracts from the ability to stop an assailant by keeping the bullet from reaching the vitals that you were aiming at. In the event you must use a .22LR for self defense, keep in mind it is really an ‘EENT’ gun: eyes, ears, nose, and throat. We want to shoot for the head or neck rather than the body. We want to aim not just at the head, or even the face, but at the soft tissue openings in the skull that provide unimpeded access to the interior. Needless to say, having to hit such small targets in a self-defense situation is undesirable, which is why I recommend calibers with better penetrating power. The .38 Special can be thought of as the revolver equivalent of 9mm. It has sufficient penetration without excessive recoil. .38 is generally slightly slower than an equivalent 9mm load, ranking somewhere between 9mm and .380. .357 Magnum is basically a longer version of the .38 Special cartridge capable of considerably higher velocity (.38 bullets are actually .357 inches in diameter). This, of course, increases recoil. While the .357 is manageable in a full size revolver in smaller, lighter guns it becomes downright painful to shoot. Because the .357 Magnum is just a longer, faster version of the .38 Special, it is possible to shoot .38 Special ammunition in a .357 Magnum revolver (but not vice versa). Many people use the lighter .38 loads for practice and .357 Magnum loads for self-defense. Made famous by Dirty Harry, the .44 Magnum is no longer the most powerful handgun cartridge in the world. It is still rather overpowered for human targets, however, and recoil is substantial even in a large revolver. The one exception would be if you’re in bear country and are concerned about defending yourself from larger, 4-legged predators. Then .44 Magnum is the minimum, rather than the maximum.